As you might've read in this week's Three Beats, local far-out art-rockers Ono, awakened from dormancy in 2007 by Steve "Plastic Crimewave" Krakow, are about to release their first record in 26 years. 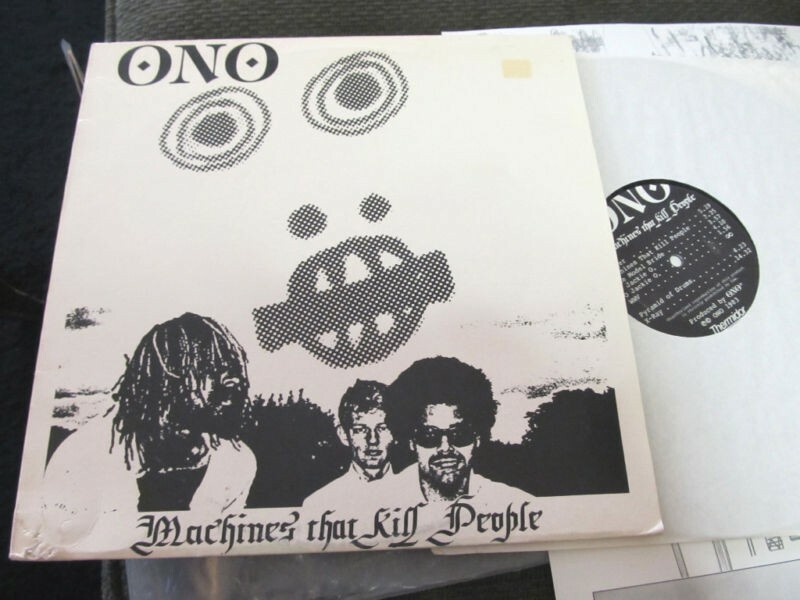 Ono's resurgence and high profile in the local scene over the past few years has increased demand not just for new recordings from the band but also for their hard-to-find old stuff, which has resulted in their out-of-print debut, 1983's Machines That Kill People (Thermidor), going for an outrageous sum on eBay. But there's good news, Ono heads! You no longer need to be part of the 1 percent to own a copy of this sought-after classic. Krakow, with the help of local (mostly) tape label Priority Male and a grant from nonprofit State of the Arts Chicago, is reissuing the landmark record. The LPs are expected to arrive next week, and feature cleaned-up and boosted sound courtesy of Cave organist Cooper Crain, hand-screened jackets, and a replica of the poster that was included with the original. Your best way to get your hands on this will be directly from Priority Male, a label best known for cranking out tapes full of Chicago's weirder sounds, such as Sich Mang, Moonrises, and Josh Burke. It also reissued obscure protopunks the Keggs last year. If you're familiar with Ono, you probably have a pretty good idea of what this LP contains: sparse electronic beats, saxophone skronk, theatrical vocals, and oddball bass riffs. The intitial pressing is 500 copies, and Ono's second album, 1986's Ennui, will get a reissue from these guys down the line as well. Ono's release show for Albino, their new LP on Moniker Records, is at Quenchers on Wed 10/31. Priority Male and Galactic Archive team up once again for a reissue. The five best takes on Smokey Robinson & the Miracles' "The Tracks of My Tears"